A well-designed page will feel natural, often intuitive. So, the question is - how do you get there, and what are the most important UX aspects to cover in any design project? Let’s take a look. Good use of UX-oriented design principles helps to create a seamless browsing experience. This is always easier to put into words than it is to do in practice. When you browse some of the most trending websites in the world today, the experience feels seamless, almost intuitive at first sight. That is largely thanks to the web designers that are behind those designs, but if you haven’t built hundreds of top-class sites as of yet, you might end up making mistakes that could cost you, or your clients, revenue in the long run. One of the key things about a truly refined design is that it doesn’t make the user question the intention behind a particular element or feature. If visitors who come to your pages have to scroll up and down to figure out how to move forward with their needs, then your design is not living up to professional standards. User experience design doesn’t apply only to a landing page or the signup form. UX design encapsulates the whole of your website and application design so that no matter which page a user is browsing, it feels connected to the rest of what your site has to offer. It’s confusing for a user to browse your site only to be faced with different variations of page designs, which can easily obscure the overall browsing experience. This is in particular true for the rapid growth of mobile design. Even just a few years ago, not many designers were worried about having to create a seamless mobile experience for their users, whereas today you can’t tell a difference between a mobile or a desktop website, because both have become interconnected for the sake of providing a wholesome user experience. Is the color scheme sitewide, and does it flow throughout all of your pages? Are you using specific keywords to highlight different parts of your design features? Does your mobile website have the same features as the desktop version? There are no limits to how good your navigation can be. You can't go wrong with creating navigation that's fast, direct and easily accessible. And you can rest assured that users will leave your site/app if your navigation doesn’t provide an effortless browsing experience. At the very top of the page, users have a few button choices - Sections, Search, and a Settings font-icon on the far right. Putting these elements directly into the header part of the page without masking them would create a much more clutter-oriented user experience. It’s as simple as avoiding putting too much content choices directly onto the homepage; instead, designers can mask certain areas using modern styling options. A search bar expands in the same header area, while masking the rest of the page, putting the sole focus on search alone. Just think how much space that search bar would take up if it was put directly onto the top of a page. Small tweaks to your navigation can go a long way towards saving precious design space. In this context, the concept of less is more applies perfectly. So, what are some other examples of seamless navigation? One of the most talked about UX trends in recent years is personalization, the idea of using user-data to deliver a more personal experience. Medium is a seriously cool content publishing platform, and its design is world-class. Some of the things that Medium does really well is content suggestions (as seen above) at the end of each article. These range from related content to pieces that come from similar parts of the website, all promoting different authors and points of view. Thus, content discovery becomes effortless, while the user himself can enjoy specifically tailored experience. Some other examples include the likes of Amazon.com, where the platform carefully analyzes your browsing history and gives you recommendations based on items you have viewed, bought or added to your wish list. Do you have more examples to add? Please do so in the comments, we’d love to see how you tackle navigation problems, and what results you have seen from making significant changes. A website that auto-plays songs or videos? -- Nope! A website that shows a pop-up down my throat in the first 10 seconds? -- Nope! A website that wants me to register to use basic features? -- No, thanks! There are many ways to annoy users, but perhaps one of the most distinct ways is the website doing things on behalf of the user. Sure, it’s important to collect email subscribers to generate leads and conversions, but there won’t be anything to collect if you make these features awfully explicit. If you have to ‘scream’ at your visitors to sign up, to like you on social media or to give you their email address, perhaps it’s a good time to rethink your strategy, because anyone who appreciates what you are doing and shows interest in your offering is naturally going to do all of those things anyway! Nowadays, we have full-header popups, annoying pop-unders, and modal boxes that require you to throw a backflip to close the damn thing! It’s a little too much, and many will tell you that they simply leave such sites because of how inconvenient they are. Why worry about losing visitor attention when you could be gaining it? All that is required is to put the user in charge of the way they interact with certain parts/elements of your pages. Video Playback -- Let users decide whether they want to play a video on your page. If it’s a promo, don’t autoplay it, as it can cause unnecessary distraction for the visitor. Modal Boxes -- Use a more refined approach to popups, like ‘open at a certain scroll ratio’, or slide the form out of the side of the page. 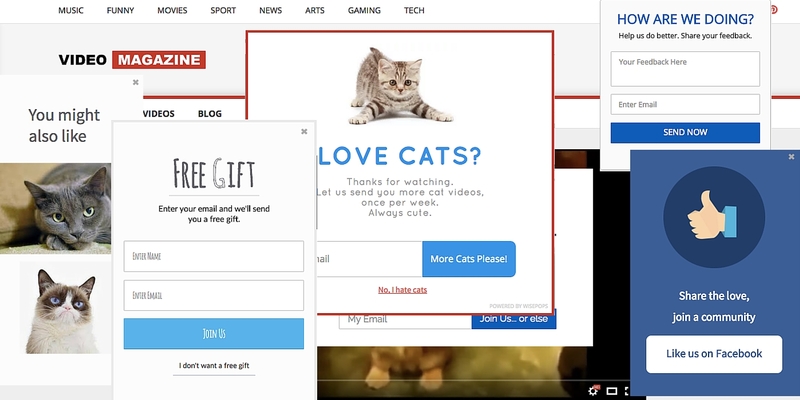 Full-on popups that take over the whole of the screen are annoying, and people will often leave your site. Adblockers -- Another trend these days is to disallow users from viewing content on your pages because they have adblock enabled. Don’t scare them away completely by not showing them content. Instead, use a seamless notification in the header/footer of the page to let them know that you’d appreciate it if they turned it off. Basic Features -- Anything that isn’t part of your premium/paid model should be available for free access at all times. Making everyone register to get a taste of what you have to offer will push people away. UX Design is all about intuition. You have to put yourself in the shoes of the visitor, you have to become the person who will visit your site, not the designer who thinks that everything he does is the right way to do it. Author Bio: Alex Ivanovs is a freelance contractor with a background in inbound marketing. He constantly works with the leading web tech brands to help them meet their business goals. Find more of his work on Colorlib, and connect with him on LinkedIn.